Hi Al. Thanks for taking the time to do this interview. The old EC headquarters have been turned into condos. Guess the neighborhood has changed quite a bit since the days you were running EC from that building. I heard Patrissy’s, the Italian restaurant Bill Gaines loved so much, has closed as well. Did you guys used to walk there from work? Patrissy's was on Spring Street, half a block East of Lafeyette Street, which is one block south of Spring Street, corner of Lafayette Street...which is where the E.C. building stood. So we just had to walk a short block and a half to reach it. I've read you guys used to do some scripting of comics over lunch, is that true? As best as I can recall, we did very little "scripting" at Patrissy's. We would take off for lunch at Patrissy's after we had nailed down the plot for the day's required script. After lunch, I would write it. Lunch at Patrissy's was usually the place for small talk; like whether we should recognize Red China. Just kidding. To me the best part about the old EC books are the Ghoulunatics. Tell me about creating those characters if you would. I had been writing and drawing western, crime and romance stories for E.C. and Bill...while continuously bugging him that all he was doing as a Publisher was imitating whatever sold... and imploring him to be an "Innovator" instead of an imitator. Finally he gave in and asked me what I thought would be an innovation in comics...and I suggested "Horror"...because I remembered as a kid, listening to "The Witches Tale" and "Lights Out" and "The Inner Sanctum" on radio...and loved being scared out of my wits. So he agreed to try what I had in mind as an experiment in his "Crime Patrol" and "War Against Crime" titles. Recalling that an integral part of those radio shows were their Hosts...I created "The Crypt Keeper" as the host of "The Crypt of Terror" for Crime Patrol and "The Vaultkeeper" as the host of "The Vault of Horror" for "War Against Crime." The sales checks showed a marked improvement in those two titles when their horror stories appeared...so Bill agreed to change their titles and give The Cryptkeeper and The Vaultkeeper their own books. Later on, I introduced "The Old Witch" as hostess of "The Witch's Cauldron" in "Tales From The Crypt"... and, based on the success of the other two "Horror" titles, Bill decided to drop another poorly-selling title and give the old gal her own book, "The Haunt of Fear." 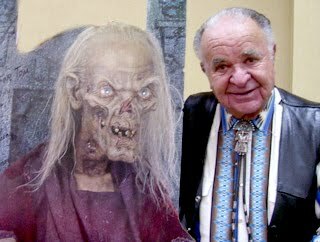 Bill lived to see the worldwide success of Tales from the Crypt, with the 1971 and 1973 Amicus films (Tales from the Crypt and Vault of Horror) and again with the 1989 HBO series. I am sure both he and you must have felt truly vindicated after the way you were attacked by Fredrick Wertham and his Congressional Cronies. We both were delighted with the recognition of our work given us with the Amicus films, except that I was horrified with the depiction of their hosts. However, when the HBO version of "Tales From The Crypt" was introduced, Bill's and my relationship has been severely strained because I had retired from MAD. And so he did not allow...or give me credit for the creation of the title, the host...and for the adaptation of all of my stories. Were you happy with HBO’s interpretation of the Crypt Keeper? Not at first. I found the cackling, lisping, obnoxious puppet a bit irritating...and not exactly what I had in mind. But he grew on me. You were born on October 24th. Think having a birth date so close to Halloween had anything to do with your affinity to horror? It never occurred to me. I think the radio shows were far more influential. Tell me more about what you’re up to nowadays. I see from your website that you’ve been spending a good deal of time painting. That's what I do now...Western, Wildlife, Landscape and Sci-Fi/Fantasy paintings. The Sci-Fi Fantasy paintings are mostly commissions for "Cover-Revisited" versions of my old E. C. covers. Are you doing any writing nowadays, or pretty much strictly art? When I retired from MAD, I made a choice between "writing" and "fine art" and my love for art won. I know you do some convention appearances as well. Do you enjoy going to shows and meeting fans? I love it. It is a great ego-stroking experience...and I am amazed at how the popularity of the E.C. products of the '50's has continued to survive over the decades...with a new audience developing with each generation. I am grateful to Russ Cochran and his "collections" and "re-prints" for that. What upcoming convention appearances will you be making? I will be at the Motor City ComiCon in Novi, Michigan this May. Thanks again for spending some time with me and I look forward to meeting you at a show in the future. Love the interview and Al Feldstein. God bless him and may he prosper and be well! Great interview with a wonderful talent. You got a good head on yer shoulder there boy! 3rd Naschycast is up and running!